Paint Booth Filter Media Blanket - 100' X 48" - Clip and Spray! Standard Tools and Equipment Co. Booth with Blanket Exhaust Filters Installed. If you’re a high production shop, doing a lot of spraying, naturally, you’ll need to change the filter media in your booth often. Changing your filter media is an important maintenance for your booth…. but let’s be honest, it’s time consuming. Do you wish there was an easier way to change them? Meet the blanket filter….. it’s going to change your life. Never change numerous 20” x 20” exhaust filters again. Order our filter media blanket by the 100’ roll and a set of quick clips to get started. Just cut the filter blanket to the size you need and clip into the quick clips at the top and bottom and you’re set to go! The blanket filter media fits over your existing filter grids, so there is no structure changes you need to make to your booth. Our dense heavy-duty two-stage 22g media is 50% heavier than the 15g counterpart. Manufactured from continuous strands of glass fibers with 2.5” loading area backed with 100% fiberglass scrim backing. Compliant with current EPA standards as well as many local municipal regulations. The 22g fiberglass construction provides excellent removal efficiency at an affordable price. WANT TO SEE MORE ABOUT THE FILTER MEDIA BLANKET? Julie and John also had a little fun with the blanket filter. If you want to see an appearance from Filterman installing the blanket filter, click here. hello i’m interested in the blankets for a paint booth. I have used the ones in the video the yellow rolls. Previous Previous post: Outfit your booth with LED lights … what a bright idea! 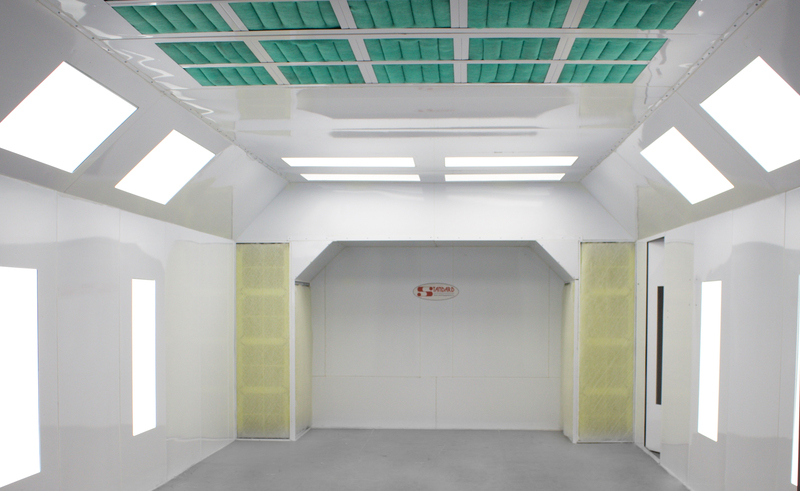 Next Next post: Buying a paint booth is easy … sort of.